Chapel Hill ban on cellphone use while driving is overturned. Court Overturns Nation’s Strongest Ban on Cellphone Use While Driving. That’s Disastrous. 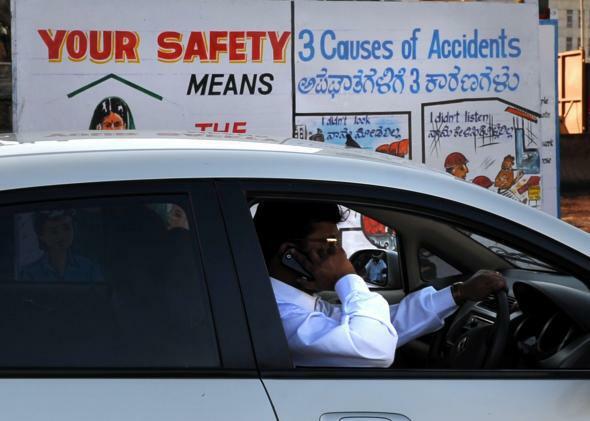 An Indian man talks on his mobile phone as he drives past a traffic awareness poster on the side of a busy road in Bangalore. In 2012, the Chapel Hill Town Council adopted a local ordinance banning all uses of a cellphone while driving, including hands-free calling and texting. The local ban was the first in the country to limit hands-free phone use for all drivers, and it was touted by safety advocates as a model to be emulated by other cities. But last week the measure was struck down by the North Carolina Supreme Court. At the center of the story has been Krista Slough, who was a senior at UNC-Chapel Hill when, while walking to the bus, she was hit by a driver on a cellphone and tossed more than 15 feet off the road. Returning again to the scene for an interview with CBS News, she pointed out where her shoes were later found. The accident occurred in front of the eyes of former town councilman and retired UNC professor Joseph Capowski, who can recall the “grotesque thump” of the impact. Slough suffered brain hemorrhaging, leading to continued pain and memory problems, and she missed a year of college while in recovery. But together with Capowski and others, Slough successfully lobbied the Chapel Hill Town Council for the expansive local ban. Then, after a series of challenges and appeals, the ordinance finally landed on the bench of the North Carolina State Supreme Court, where on Thursday it was definitively repealed. The court reasoned that, since some cellphone-related issues such as texting while driving had been addressed at the state level, the town did not have the authority to pass a local ordinance on the topic. Former Secretary of Transportation Ray LaHood made the issue of texting while driving a central focus of his tenure, and the recent proliferation of state laws against texting is a signature accomplishment. But he stopped short of pushing for the regulation of hands-free phones. Another government body, the National Transportation Safety Board, has sought further regulations, calling for bans on all distracting in-cab electronics, including hands-free phones, and praised the Chapel Hill town ordinance. It is not yet clear what kind of stand current Secretary of Transportation Anthony Foxx, who entered office in July 2013, will take, though he has begun to make statements of concern over distracted driving. Defenders of the Chapel Hill cellphone ban claim to have science on their side. After more than a decade of study, researchers in the field of cognitive science have compiled a preponderance of evidence showing that handheld and hands-free cellphones are associated with the same dangerous drop in driving performance. This is especially disconcerting in light of the fact that a majority of drivers still incorrectly believe that hands-free phones are a safe alternative. But George King, the owner of George’s Towing and Recovery who first filed the challenge to the Chapel Hill cellphone ban, says this is ultimately an issue of individual liberty, not research. King says, “If it weren’t for us, the city would have taken your rights completely away from you.” But though King certainly has his supporters, not all libertarians agree with him on these sorts of measures. For example, on the related topic of the use of Google Glass while driving, Gary G. Howell, a Republican in the West Virginia House of Delegates, thinks differently. He says, “I am a libertarian, and government has no business protecting us from ourselves, but it does have a duty to make sure I don’t injure or kill someone else.” Indeed a number of states are already looking into restricting the use of Google Glass while driving. That’s great news—but we can’t forget about hands-free phones while we rush to regulate the use of still-newer technologies behind the wheel.